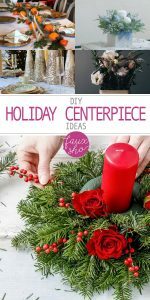 This holiday season, make your entertaining a little extra special with a DIY holiday centerpiece. Don’t let the words “DIY” or “centerpiece” scare you off. A DIY holiday centerpiece can be as simple or as involved as you want to make it. 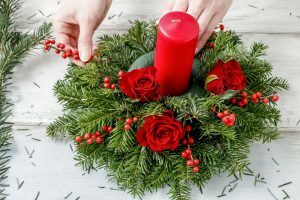 So no matter where you fall on that scale, there’s something on this list of DIY holiday centerpiece ideas for you. Take a look! One pretty easy DIY holiday centerpiece idea is to make an evergreen base for a pillar candle. 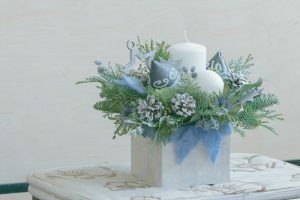 You can make this centerpiece with either natural or faux evergreen sprigs, and a real or battery-operated candle. You’ll need a circle of floral foam, some red berry picks, and silk roses. Starting at the base of the foam, insert evergreen sprigs evenly around the foam every couple of inches. Once you have a base, continue to fill in until your centerpiece is as full as you want it. If you use natural evergreen sprigs, soak the floral foam in water before using, and your DIY holiday centerpiece will last much longer. Find all the supplies for this project at Michaels! If you want simple, try this DIY holiday centerpiece idea. 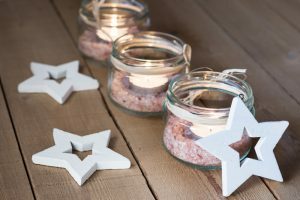 You’ll need a trio of small mason jars, some Himalayan pink salt, jute or twine, wooden stars and tealight candles. This idea highlights the power threes in any of your décor ideas–an odd number of items always looks better than an even number. This idea is more of a tablescape, but it can easily be adapted to cover less of the table. 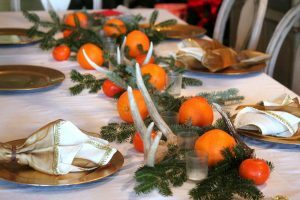 Just arrange antlers, evergreens, oranges and Clementines together down the center of the table. Add some clear glass votives for extra effect. Did you know you can buy natural-looking antler picks at Michaels? 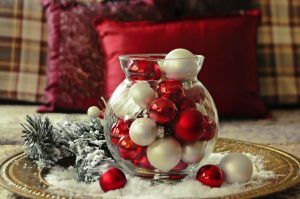 Another easy DIY holiday centerpiece involves a simple gold charger, glass vase, ornament balls, faux snow and evergreen sprigs. I like the fact that once this is arranged, you can easily move it from place to place as the need arises. And it’s so inexpensive you can make more than one! Find gold chargers and everything else you need for this project at Dollar Tree. If you’re into interesting color combinations for your Christmas décor, then something like this blue and white DIY holiday centerpiece might be for you. Start with a square vase. 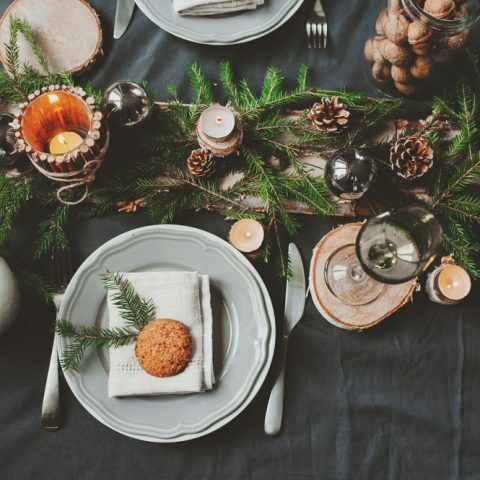 Add evergreen sprigs, white-tipped pinecones, blue & white ornaments and a white pillar candle. I love this! How to Sharpen Knives and Scissors!